It is the 400th episode of Disney Every Week with the PassPorter Moms! To celebrate, we are talking about our favorite subject - FOOD! 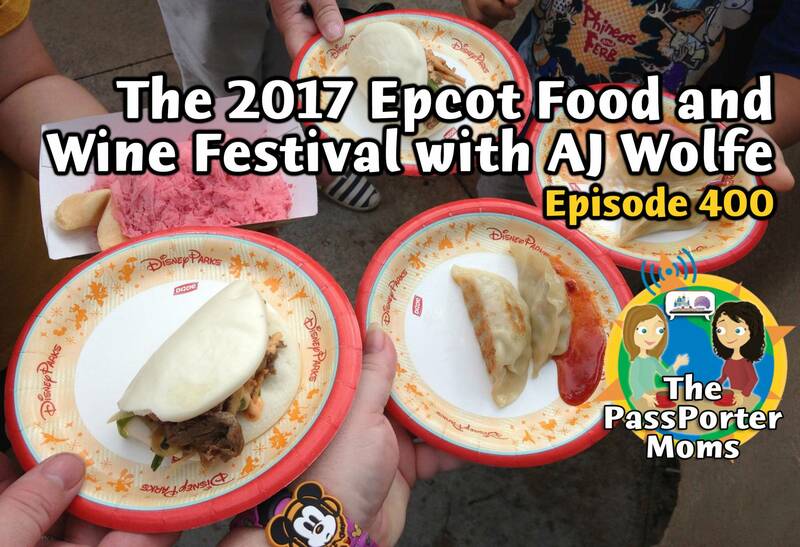 This week Jennifer, Sara, and AJ Wolfe from the Disney Food Blog are discussing the 2017 Epcot International Food and Wine Festival and sharing their favorite tips. Plus an update from AllEars.Net, a sneak peek at PassPorter News, and more. AJ has been a Disney parks fan since her first trip to Disney World as a wee one. Now she can’t ever decide between Disneyland and Disney World, and luckily lives in Texas, equidistant between her two favorite places. Her focus on Disney food started during a trip while in graduate school, when she was more excited about choosing restaurants than choosing rides. Today, she owns, writes, and edits the Disney Food Blog, which covers Disney food news and offers information and reviews on all things Disney food. AJ is also the author of seven e-books about Dining and Vacationing in Disney World, including The DFB Guide to Disney World Dining and The DFB Guide to Walt Disney World Holidays from DFBstore.com. - Special Events - worth it?